Geo-Fresh organic – a “House of Organics” was incorporated with the aim for implementation as well as promotion of organic farming and to facilitate marketing of various organic produce. Geo Fresh Organic maintains the bond of trust and co-operation with farmers and customers to promote organic cultivation in India and Supply these products World Wide. 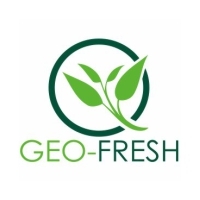 Geo Fresh Organic firmly believes in healthy, long-term relationship with the farmers/suppliers and customers, by providing continuous flow of standard quality products and outstanding services. Geo Fresh Organic has certified Organic farms, processing units for raw materials processing and powdering, herbal extractions and steam distillation, enabling it to deliver Organic products with ultimate quality standards with required purity. Geo Fresh Organic is proud to be first to produce organic certified food and cosmetic grade products at its Steam sterilizing, Glycerine, Plant Protein and Soy lecithin manufacturing units.